For the first time since 1997, the Baltimore Orioles are heading to the ALCS after beating the Tigers 2-1 in Detroit. They played the Cleveland Indians in the 1997 ALCS and lost in six games. The only runs for the Orioles came off the bat of Nelson Cruz on a day that was very cold and windy. Cruz hit an opposite field two run home run in the sixth inning off of David Price, the ball looked like it was going to be foul, but somehow the ball stayed fair. It was Cruz second home run of this postseason, and his 16th career postseason home run. Bud Norris pitched a gem for Baltimore going 6 1/3 innings and only giving up two hits and striking out six. It was Norris first career postseason start and he made it a memorable one. Baltimore finished with only five hits all off of Price. The Orioles faced the three previous AL Cy Young Winners and still sweep the Tigers. Detroit season came to an end, and yet again they fall short in the postseason. 2012 AL Cy Young Winner David Price was on the mound for the Tigers, he went eight innings and gave up both runs. The Tigers traded Austin Jackson and Drew Smyly for Price, now Detroit will have to decide if they sign Price back. J.D. Martinez drove in Victor Martinez in the ninth to give Detroit their only run. The Tigers finished with four hits. Detroit is running out of time to win a World Series with what they have built. Miguel Cabrera still had a good season this year, but he isn’t getting any younger. Victor Martinez will be 36 next season and Tori Hunter will be 40 in July of next year. The Tigers should be right back in it next season, as long as they have no key injuries. They’re still missing pieces specifically in the bullpen and will need to make some additions if they want to get back to the World Series. They should have a strong rotation yet again. 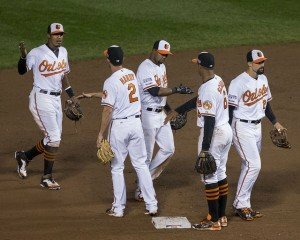 Baltimore will face either the Angels or Royals on Friday, October 10th. It looks to be the Royals right now as their blowing the Angels out as I type this, but anything is possible. The Orioles haven’t won a pennant since 1983, beating the Chicago White Sox in four games. They also won the World Series that season beating the Philadelphia Phillies.